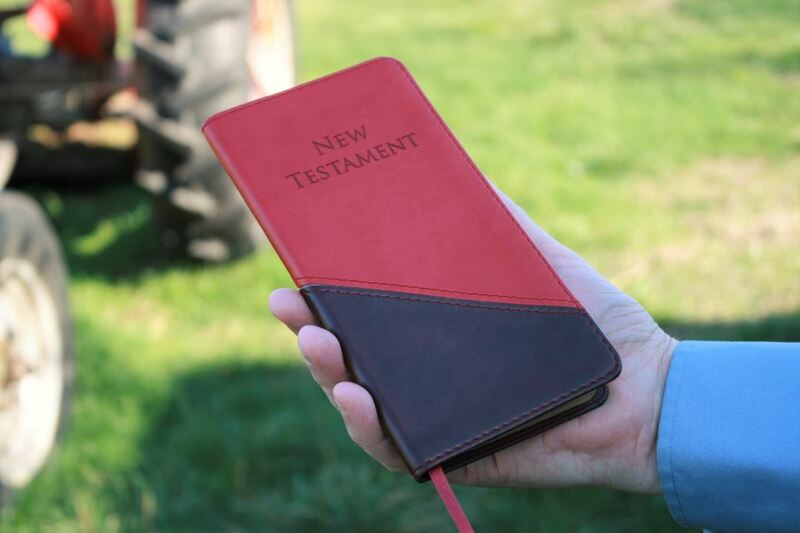 The TBS Slimline Pocket New Testament is one of those checkbook style Bibles that’s made to carry in your coat pocket or purse. 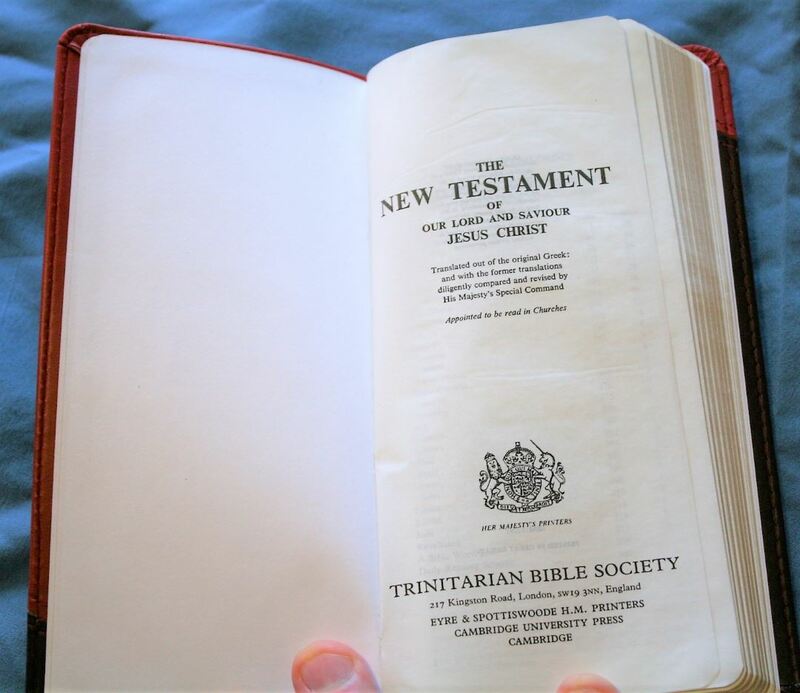 Although it’s only a New Testament, this edition is by far my favorite in this format. 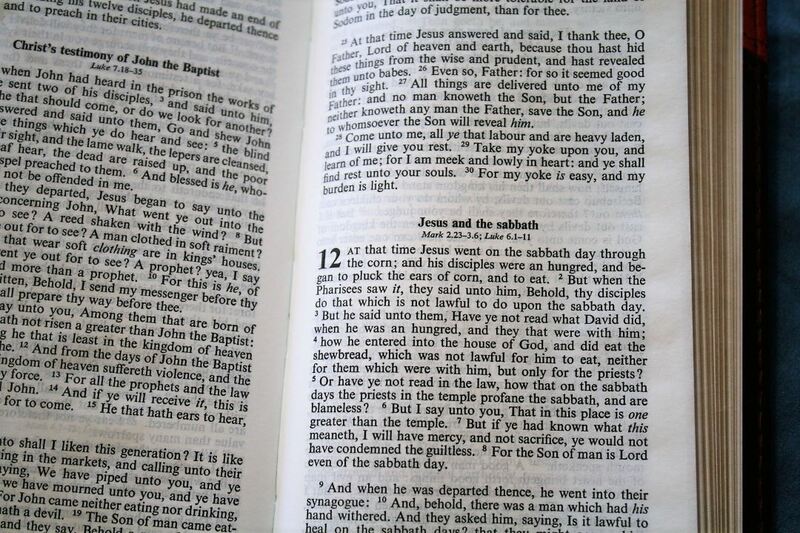 It has a feature that I’d love to see become more popular in KJV’s: single column paragraph. The cover is a two-tone polyurethane called Vivella. It has a white paper liner (which gives me some ideas) and is stitched around the perimeter. 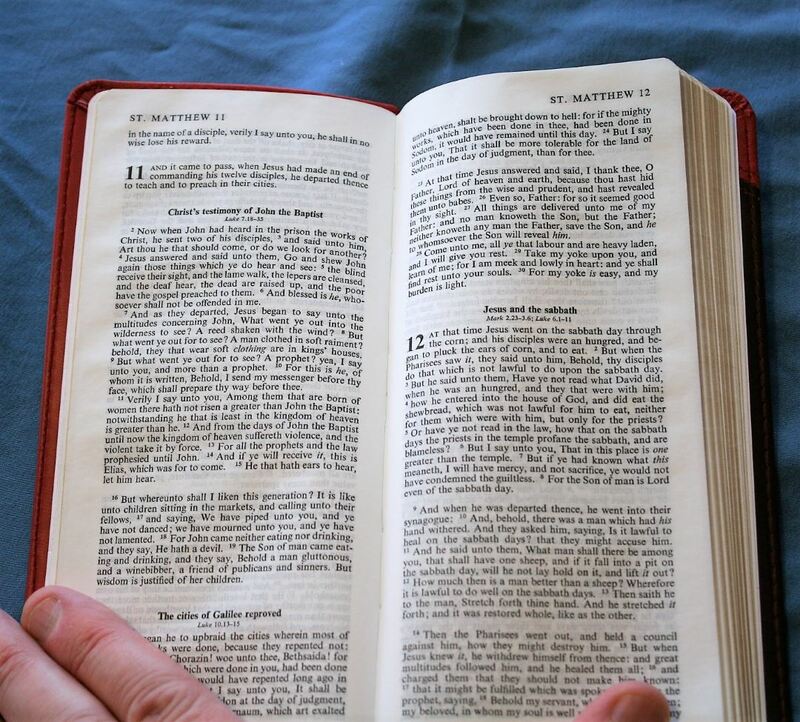 It’s stiff, so it doesn’t want to lay open on its own, but it is easy to hold open with one hand for reading. 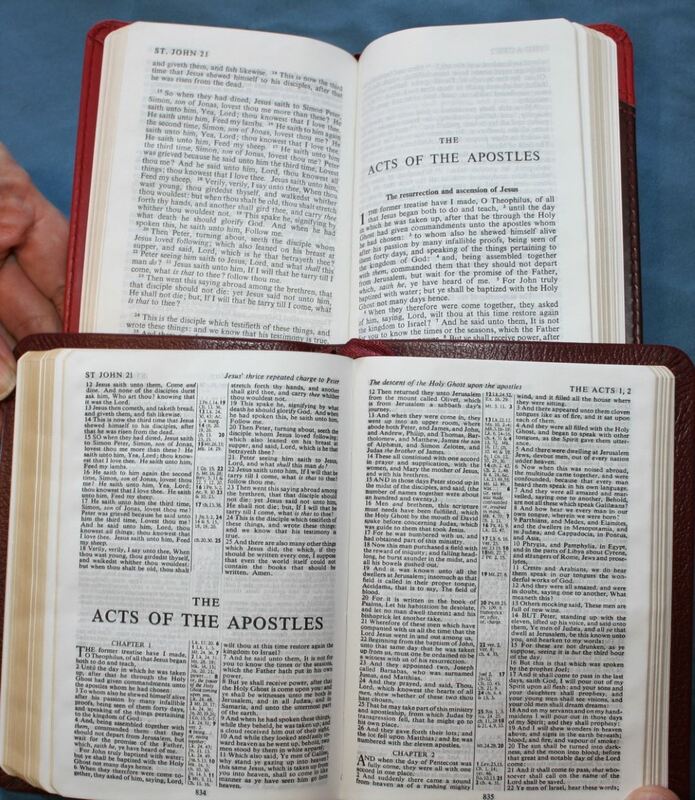 This is the kind of Bible you’d want to hold to read anyway. The cover is stiff but it’s softer than it seems. If something is laid on top of it that has a pattern, that pattern will temporarily imprint into the cover. It will go back to normal, but it is something to be aware of. The size of this NT is one of its greatest advantages. It as proportions like a checkbook, with an overall size of 7.1 x 3.6 x .43”. It fits perfectly into a coat pocket for carry. 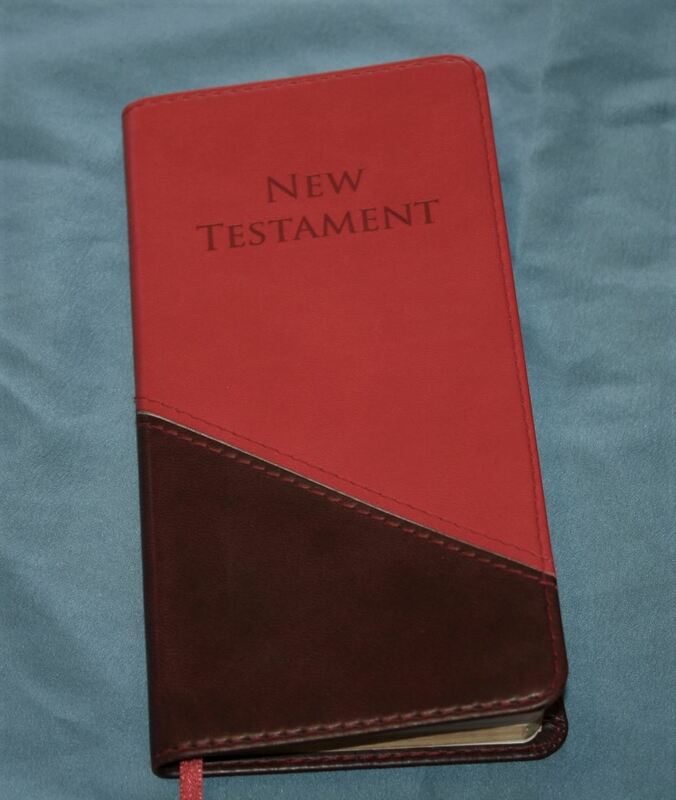 It has a large enough yapp that I never worried about getting the page edges scratched. The long burgundy ribbon can be pulled to the corner and still have a lot of material to hold onto. I’m just guessing on the gsm, but it feels like around 28ish to my fingers. It’s highly opaque and has very little show-through. It’s off-white in color and has the perfect contrast against the dark font for reading. I had no issues with turning pages or with page curl. The text is presented in single column paragraph format with section headings throughout the text. The header shows the book name and chapter number in the upper outer corner and the footer shows the page number in the bottom outer corner. The font is 7-point black letter. It’s a dark font that’s sharp and looks great. It does have some slight variation in darkness but it isn’t bad. It does not have pronunciation marks to hinder readability. It does have italics for supplied words (which I prefer). It seems to have line-matching (at least on most pages). It has the same font as the Pitt Minion but it has a larger leading (space between the lines) so it’s easier to read. The verse numbers are super-script. I find them easy to find when searching and easy to ignore while reading. Section headings are in bold. 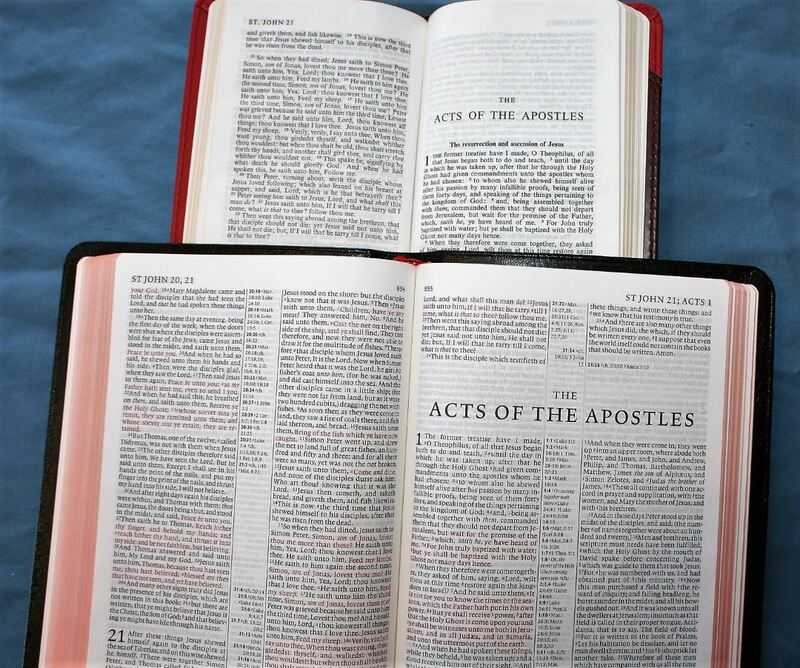 Those in the Gospels include references to the other Gospels, creating a Harmony of the Gospels. It has no other references or footnotes but this is meant to be a compact NT optimized for reading, so that’s expected. 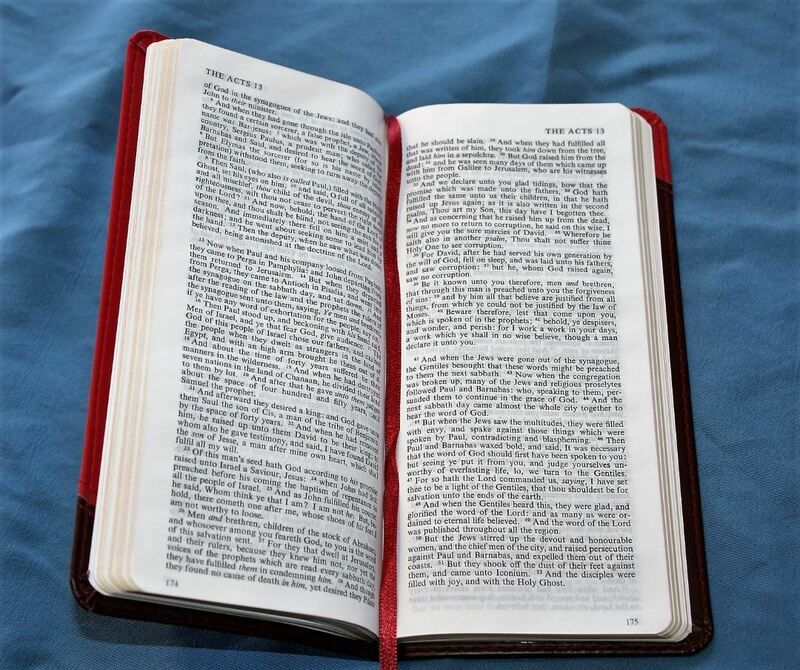 The layout isn’t the standard verse-by-verse edition that’s so popular among publishers. 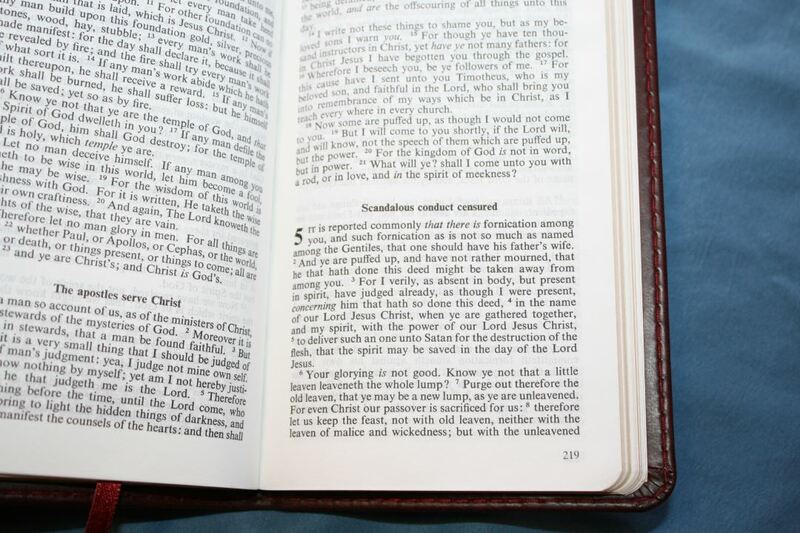 Verse-by-verse KJV’s place each verse on its own line with each verse having a capitol letter as if it was a new sentence, but often one sentence can span many verses. 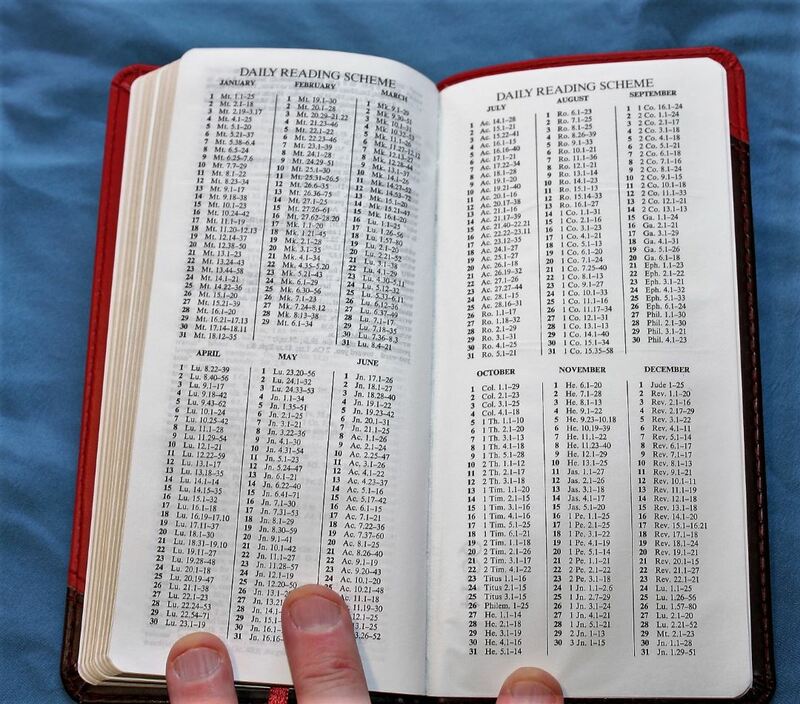 This is helpful for finding verses, but it’s terrible for reading. In my opinion it’s terrible for study because it makes it too easy to take verses out of context as stand-alone thoughts. Better reading and study methods would look at paragraphs and contexts rather than pieces of sentences. 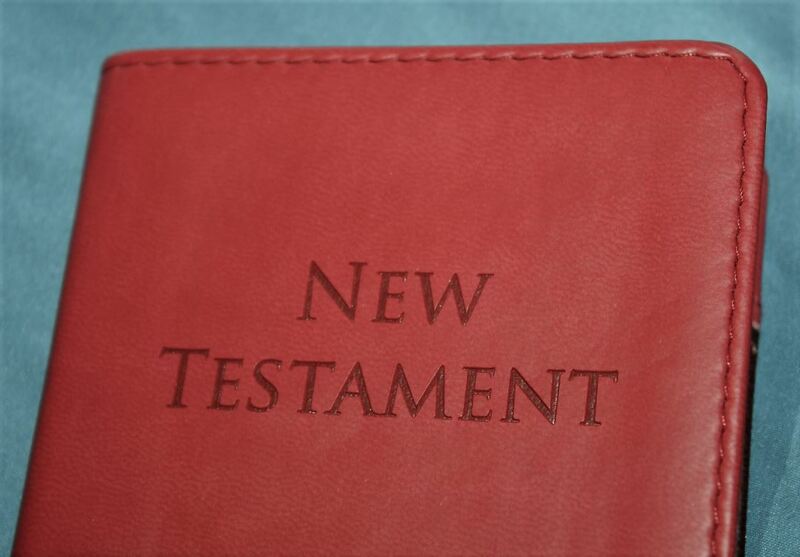 This Bible fixes that problem by keeping the sentences intact, making a NT that helps reading rather than hindering it. When there’s a subject change there is a space between paragraphs. Some of them have bold section headings but many do not. This leaves lots of white-space on the page and improves the readability. The columns are 2.5” wide. They have around 58 characters and around 10 words per line, giving an optimal reading experience. The words never feel cramped. It has 60 lines per page. It has a wide inner margin, keeping the text almost perfectly flat so there are no bended lines. 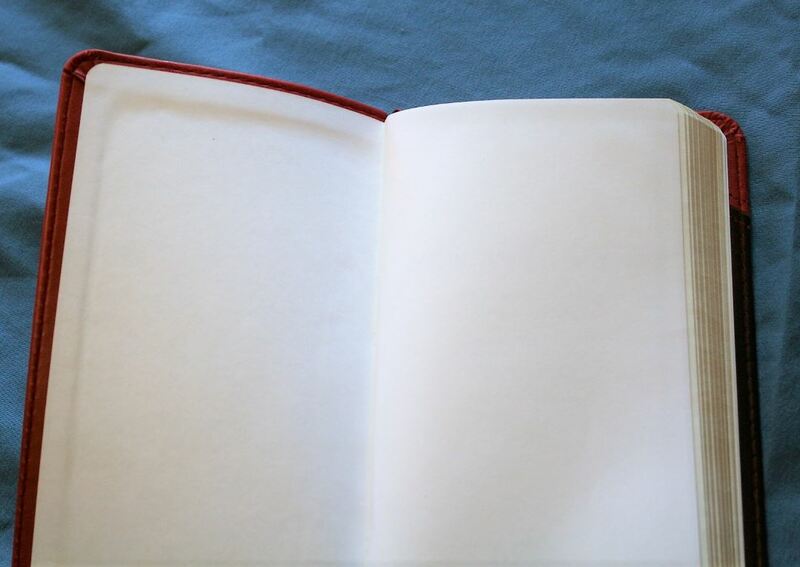 Each book starts on a new page, so there’s a little bit of space for notes if you want to write in it. This is a 9.5 page glossary that describes unfamiliar weights and measures, money, objects, animals, words that have gone out of use, and words that have changed meaning. The words include a short definition and references where the word is used. If the word is uses with more than one meaning that’s also indicated. It does include some OT references, so this is a good general word list. I’m glad this is included because it helps make the KJV more usable. I recommend going through this list to learn about the words because you won’t always know to look up a word that has changed meaning. 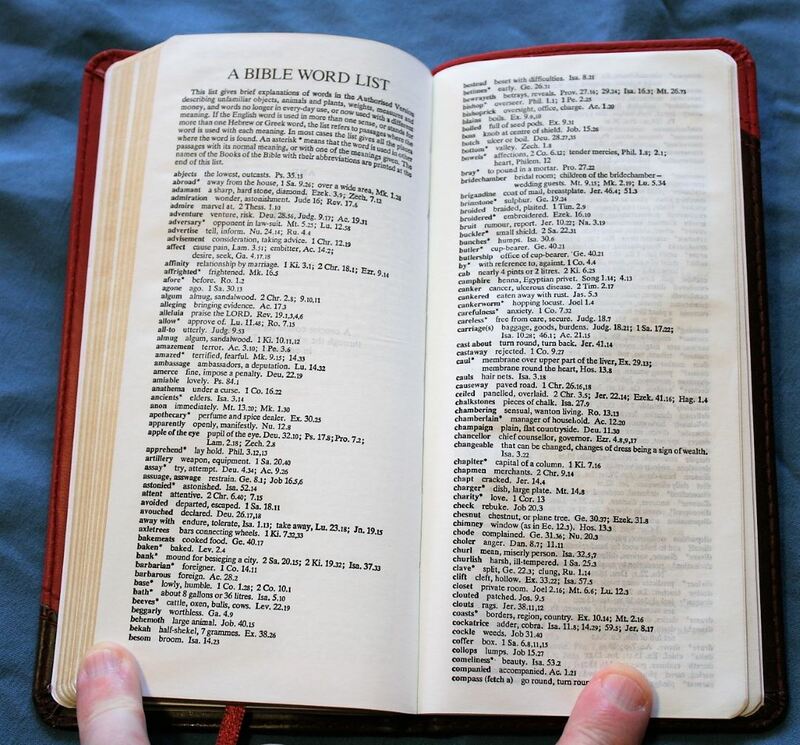 I’d like to see a glossary to be standard in all KJV’s. 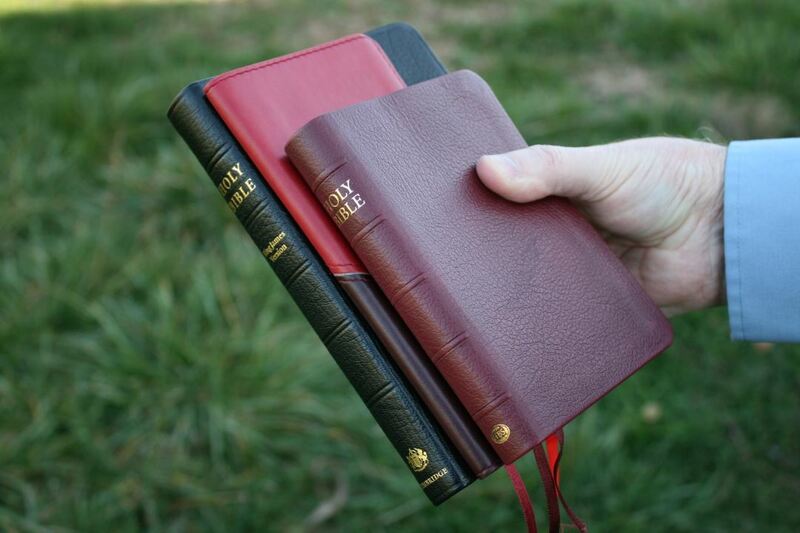 The reading plan takes you through the New Testament in one year in biblical order. 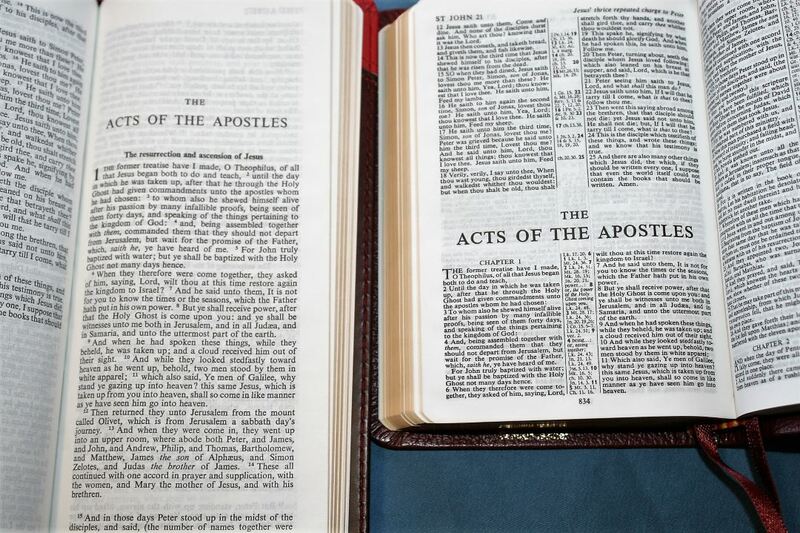 The last week of the year covers the chapters of Jesus’ birth. Here’s how it compares to the TBS Pocket Reference and the Cambridge Pitt Minion. I love the design of this NT. The single-column paragraph format is highly readable and the size is perfect for carry and holding to read. If I could get this in a full Bible this would be the Bible I carried. It’s made for reading and for carry. It’s low cost and light weight. If you can read a small font then you’ll love reading this NT. TBS provided this Bible free for review. I was not required to give a positive review – only an honest review. My opinions are my own.